It is basically a reverent loyalty to familiar ways of life and familiar places... it is true to say that for the masses in Japan love of country, as in other lands, is a matter of the heart first, and of doctrinal substance second (John B. Noss, Man's Religions, New York: MacMillan Company, 1969, p. 316). Shinto denotes "the traditional religious practices which originated in Japan and developed mainly among the Japanese people along with the underlying life attitudes and ideology which support such practices." Various implications can immediately be derived from this statement of a modern Shinto scholar. First, Shinto does not refer to an organized, clearly-defined body of doctrine nor to a unified, systematized code of behaviour. The origins of Shinto are lost in the hazy mists enshrouding the ancient period of Japanese history, but from the time the Japanese people became conscious of their own cultural character and traditions, the practices, attitudes and ideology that eventually developed into the Shinto of today were already included within them (Clark B. Offner, in The World's Religions, Sir Norman Anderson, ed., Grand Rapids: William B. Eerdmans Publishing Company, 1976, p. 190). The Japanese came early to the belief that their land was divine, but late to the nationalistic dogma that no other land is divine, that the divinity of Japan is so special and unique, so absent elsewhere, as to make Japan "center of this phenomenal world" (John B. Noss, op. cit., p. 316). The Japanese name for their country is Nippon, which means "sun origin' " Until the end of World War II, Japanese children were taught at school that the emperors were descendants of the sun-goddess, Amaterasu. Amaterasu had allegedly given the imperial house the divine right to rule. In 1946, in a radio broadcast to the Japanese people, Emperor Hirohito repudiated his divine right to rule. Shinto's history can be divided into a number of stages. The first period was from prehistoric times to 552 A.D. when Shinto reigned supreme among the people of Japan without any serious competition. In 552 A.D. Buddhism started gaining in popularity among the Japanese people. In the year 645 A.D., the Emperor Kotoku embraced Buddhism and rejected Shinto. From A.D. 800 to 1700, Shinto became combined with other religions, mixing with both Buddhism and Confucianism and forming what is called Ryobu Shinto, or dual-aspect Shinto. Shinto, by itself, experienced a considerable decline during this period. The two fundamental doctrines are: that Japan is the country of the Gods, and her inhabitants are the descendants of the Gods. Between the Japanese people and the Chinese, Hindus, Russians, Dutch, Siamese, Cambodians and other nations of the world there is a difference of kind, rather than of degree. The Mikado is the true Son of Heaven, who is entitled to reign over the four seas and the ten-thousand countries. From the fact of the divine descent of the Japanese people proceeds their immeasurable superiority to the natives of other countries in courage and intelligence. They "are honest and upright of heart, and are not given to useless theorizing and falsehoods like other nations" (Cited by Robert E. Hume, The World's Living Religions, New York: Charles Scribner's Sons, rev. ed., 1959, p. 172). These ideas revitalized Shinto among the Japanese people since it reestablished the divine origin of the land and the people of Japan. Japanese Emperor Meiji established Shinto as the official religion of Japan in place of Buddhism. However, since the people continued to embrace both religions, in 1877 Buddhism was allowed to be practiced by the people, with total religious liberty granted two years afterward. State Shinto, which is to be regarded as a patriotic ritual by the citizens irrespective of their religion, paid homage to the Emperor, and was established in 1882. This soon became, for all intents and purposes, the state religion. After the military victories of Japan in World War I, the idea of the divinity of the Emperor became solidly entrenched again in the people. It was not until the defeat of World War II that state Shinto was abolished as the religion of the Japanese people. With the fall of state Shinto, the shrines no longer came under government control and are now supported by private means. Shintoism displayed, and still displays, a powerful sense of the presence of gods and spirits in nature. These spirits are called kami, literally "superior beings;' and it is appropriate to venerate them. The kami are too numerous to lend themselves to a systematic ordering or stable hierarchy, but among the many the sun goddess Amaterasu has long held a central place in Shinto belief. According to the myth found at the beginning of the Kojiki, the earliest of the celestial gods who came into being instructed Izanagi and Izanami, male and female deities of the second generation of gods, to create the world, and in particular the islands of Japan (the two were in effect identified). Through the process of sexual generation they produced the land, and the kami of the mountains, trees, and streams, the god of the wind and the god of fire, and so on. Eventually... the goddess Amaterasu, the great kami of the Sun, came into being. Possibly, prior to the mythological account of her origin she was the mother goddess of the Yamato clans; the mythology may reflect the way in which the other deities were successively replaced in the earliest period, and then were put under the dominance of the chief kami of the Yamato. But the line between kami and human is not a sharp one, however exalted some of the deities may be. The Japanese people themselves, according to the traditional myths, are descended from the kami; while the line of emperors traces its descent back to Arnaterasu. Amaterasu sent her son Ni-ni-gi down to rule Japan for her, and thence the imperial line took its origin (this tradition in recent times was given exaggerated emphasis in order to make Shinto into an ideology justifying a nationalistic expansionist policy). The line, too, between the personal and impersonal in the kami is fluid. Some of the spirits associated with particular places or things are not strongly personalized, though the mythology concerned with the great gods and goddesses is fully anthropomorphic (Ninian Smart, The Religious Experience of Mankind, New York: Charles Scribner's Sons, 1969, pp. 192, 193). Although Shinto does not consider any one volume as the wholly inspired revelation on which its religion is based, two books are considered sacred and have done much to influence the beliefs of the Japanese people. These works are Ko-ji-ki, the "records of ancient matters" and Nihongi . , the "chronicles of Japan." They were both composed around 720 A.D. and in that they report events occurring some 1300 years earlier in the history of Japan, they are to be considered late works. The Ko-ji-ki is the oldest existing written record in Japanese. The work contains myth, legend and historical narrative in relating the story of Japan, the imperial ancestors and the imperial court. The work was compiled around 712 A.D. The Nihon-gi, compiled around 720 A.D., chronicles the origin of Japan up until 700 A.D. Since Shinto has neither a founder, sacred writings, nor any authoritative set of beliefs, there are great diversities in the two types of Shinto practiced and the beliefs held. Some Shinto groups do claim a founder, authoritative scriptures, and specific doctrine. These groups are designated sects of Shinto. However, the majority of practitioners have no such set beliefs but worship freely at various shrines located throughout Japan. This practice of Shrine Shinto is usually identified with the term Shinto. The basic place for worship in Shinto is at one of the numerous shrines covering the country of Japan. Although many Shintoists have built altars in their homes, the center of worship is the local shrine. Since Shinto has a large number of deities, a systematic worship of all such deities is impossible. The Shinto religious books acknowledge that only a few deities are consistently worshipped, the chief being the sun-goddess, Amatemsu. There is a grand imperial shrine dedicated to the worship of Amaterasu at Ise, some 200 miles southwest of Tokyo. This centralized place of worship is the most sacred spot in all of Japan. The practice of worshipping at this particular spot has its roots before the time of Christ. It is here that the Shintoists make a pilgrimage to worship at the outer court, while the inner court is reserved for the priests and government officials. Amaterasu is the chief deity of Shinto and is feminine rather than masculine. 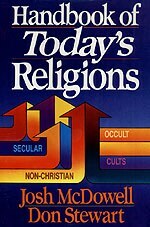 That the highest object of worship from whom the divine ancestors arose is a female rather than a male deity is unique among the larger world religions. I declare in the great presence of the From-Heaven-shining-great-deity who sits in Ise. He will pile up the first-fruits like a range of hills in the great presence of the Sovereign great goddess, and will peacefully enjoy the remainder. The religion of Shinto is in opposition to Christianity. The fact that Shinto in its purest form teaches the superiority of the Japanese people and their land above all others on earth is diametrically opposed to the teaching of the Bible. According to the Bible, the Jews are God's chosen people through whom He entrusted His words. "Then what advantage has the Jew? or what is the benefit of circumcision? Great in every respect. First of all, that they were entrusted with the oracles of God" (Romans 3:1, 2, NASB). However, though the Jews are God's chosen people, they have never been designated better than any other people (Galatians 3:27) and they have never been taught that they were direct descendants of the gods, as Shinto teaches. Shintoism fosters a pride and a feeling of superiority in the Japanese people. This type of pride is condemned by God, who says, "There is none righteous, not even one" (Romans 3:10, NASB). The same lesson was learned by the Apostle Peter who concluded: I most certainly understand now that God is not one to show partiality, but in every nation the man who fears Him and does what is right, is welcome to Him" (Acts 10:34, NASB). Since Shinto teaches the basic goodness and divine origin of its people, there is no need for a Savior. This is the natural consequence of assuming one's race is of celestial origin. Christianity teaches that all of us need a savior because our sins need to be punished. God, through Jesus Christ, took that punishment on Himself so that all mankind could be brought back into a proper relationship with Him. "Namely, that God was in Christ reconciling the world to Himself, not counting their trespasses against them, and He has committed to us the word of reconciliation. Therefore, we are ambassadors for Christ, as though God were entreating through us; we beg you on behalf of Christ, be reconciled to God. He made Him who knew no sin to be sin on our behalf, that we might become the righteousness of God in Him" (2 Corinthians 5:19-21, NASB). Furthermore, the Ko-ft-ki and Nihon-gi, as the basis of the Shinto myth, are found to be hopelessly unhistorical and totally unverifiable. The stories and legends contained in these works are a far cry from the historically verifiable documents of both the Old and New Testaments. Disorder of the churches - 1 Corinthians 1:11; 15:12; 2 Corinthians 2:4, etc. Josh McDowell, Evidence That Demands a Verdict, San Bernardino, CA: Campus Crusade for Christ International, 1972, p. 23). Shinto finds little acceptance apart from Japan since everything of Japanese origin is exalted and that which is non-Japanese is abased. Shinto is a textbook example of a religion invented by man to explain his ancestry and environment while taking no consideration of anyone but himself. Amaterasu -The sun-goddess, the chief deity worshipped in Shintoism. Bushido Code-Literally, "the warrior-knight-way!' The code practiced by the military class of the feudal period (Samurai) which has held a fascination with the Japanese people throughout its history. The code is an unwritten system of behavior stressing loyalty to emperor and country. Emperor Meiji -The Japanese emperor who established Shinto as the state religion of Japan. Harakiri -The ceremonial suicide committed by the Bushido warrior performed as an atonement for failure or bad judgment. The warrior believed death was to be preferred to disgrace. Izanagi -The "female-who-invites!' The female deity who, according to the Shinto myth, gave birth to the eight islands of Japan. Izanami-The "male-who-invites. " The male deity who, along with the female deity Izanagi, helped produce the Japanese islands and the Japanese people. Jigai -The method of suicide consisting of cutting the jugular vein. It is committed by females as an atonement for their sins. Kami -The sacred power found in both animate and inanimate objects. This power is deified in Shintoism. Kami Dama -"The god shelf" which is found in most private homes on which are placed memorial tablets with the names of an ancestor or deity inscribed on it. Ko-Jfi-Ki- The "records of ancient matters" composed in 712 A.D., charting the imperial ancestors and the imperial court. Mikado-A term used by foreigners to designate the emperor of Japan. Nihon-Gi-The "chronicles of Japan" composed around 720 A.D. This work is a history of Japan from its origin until 700 A.D.
O-Harai -"The Great Purification. " The greatest of all Shinto ceremonies by which the people go through a national purging of their sins. Ryobu Shinto-Also known as, "dual aspect Shinto." The term refers to the mixing of Shintoism with Buddhism and Confucianism. Shintai -An object of worship housed in the inner sanctuary of a Shinto shrine. The Shintai is usually an object of little value, such as a sword or mirror, but it supposedly contains magical powers and consequently is viewed as a good-luck charm. Shinto-The term Shinto is derived from the Chinese term, Shen-tao, meaning the "way of the higher spirits!' Shinto is the designation for the religion that has long characterized Japan and its people. Shinto Myth -The belief that the islands of Japan and the Japanese people are of divine origin. State Shinto-The patriotic ritual, established in 1882, which worshipped the emperor as the direct descendant of the gods. State Shinto was abolished at the end of World War II. Hume, Robert E., The World's Living Religions, New York: Charles Scribner's Sons, rev. ed., 1959. Noss, John B., Man's Religions, New York: MacMillan Company, 1974. Grand Rapids, MI: William B. Eerdmans Publishing Company, 1976. Smart, Ninian, The Religious Experience of Mankind, New York: Charles Scribner's Sons, 1969.